Football fans at all levels have heard the adage that “its not how you start but how you finish”. 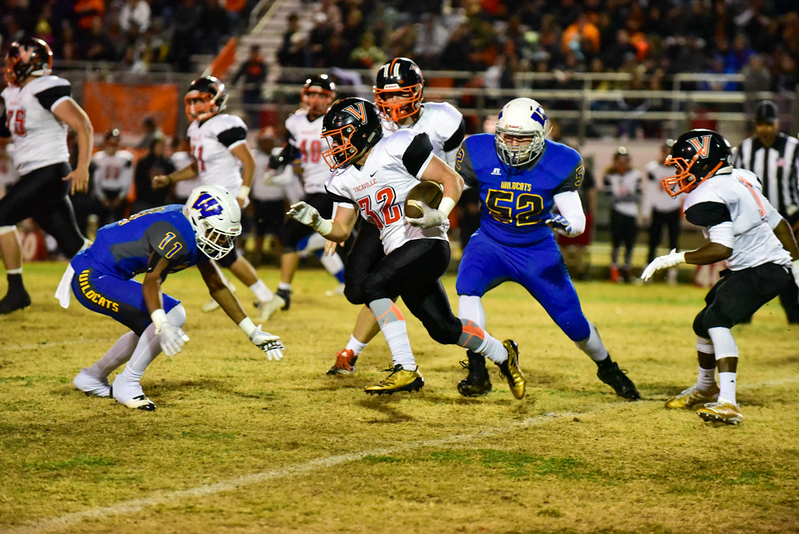 But for Friday night’s MEL champion deciding Black and Blue Bowl, Vacaville’s overpowering start was simply too much for Will C. Wood amid Friday night’s action at Tom Zunino Stadium. In a season finale deemed by many in town as one of the biggest in the cross-town rivalry’s history, Friday night’s 28th annual meeting was all black and little blue with the Bulldogs cruising to the 49-7 win. Vacaville senior speedster Timothy Jackson has seemingly scored a touchdown every which way on the gridiron this season. Jackson, who had yet to savor the taste of a MEL championship, was a man with a mission on Senior Night as he accounted for three of the Bulldogs’ seven rushing touchdowns and added 146 rushing yards on 14 carries.